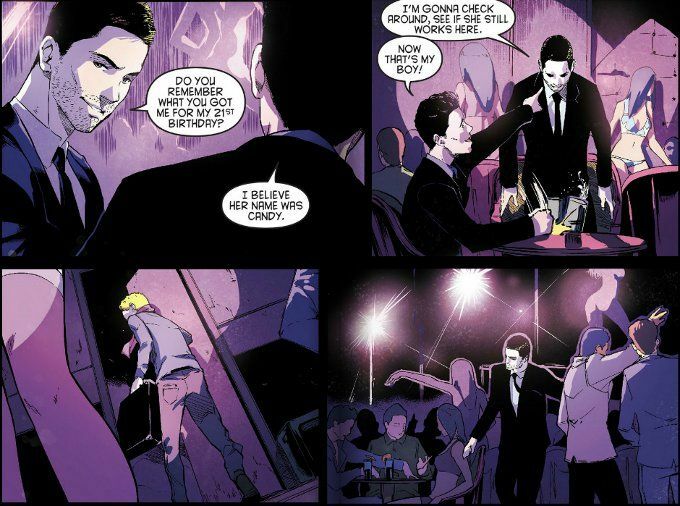 Arrow #7 continues the show's recent trend of highlighting how Oliver's double-life is hurting his normal relationships. 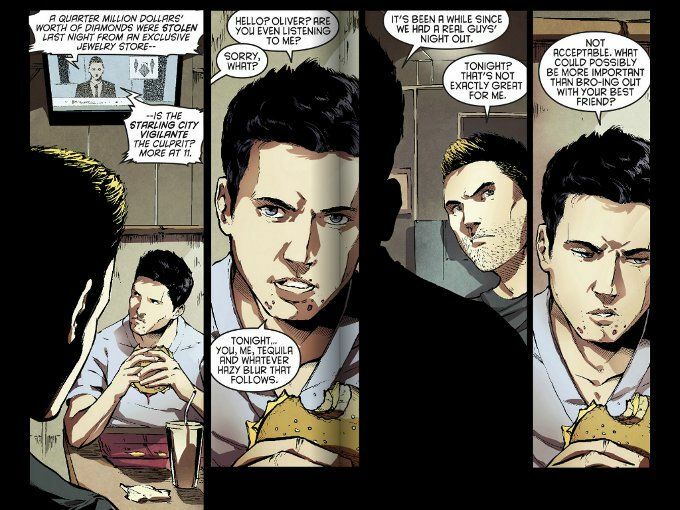 This time, however, the focus is on Oliver's relationship with best bud Tommy Merlyn. Currently focused on bringing down a gang of jewel thieves, Oliver has been neglecting his duties as a wing-man. This leads Tommy to propose a Boys Night Out so the two can catch-up. Can Oliver find a way to balance his bromance with clearing his name?. Beth Schwartz' script deals with some of the potential complications with this story in subtly clever ways. The first question some fans might ask is "Why doesn't Ollie just get Diggle go fight the jewel thieves?" Shwartz provides us with an answer and it is a satisfactory one. Schwartz also refuses to dumb down any of the characters for the sake of the story and there is some implication at the story's end that Tommy may be starting to put two and two together regarding what Ollie is spending his evenings doing. As usual, Jorge Jimenez's artwork is appropriately atmospheric. The inks are heavy this time around, subtly reflecting the shadow-world that Oliver Queen now inhabits and the deception that is now second-nature to him. The color palette is well chosen, using darker, paler shades in the scenes where Ollie is Ollie - again reflecting how unreal those moments seem to Oliver now, who only comes alive - visually speaking - when he is fighting as The Hood.